The Atkins diet, first published in 1972 and reinvented 20 years later, has helped countless people lose weight, but isn't without controversy. The diet severely limits your intake of carbohydrates -- found in sugar, bread, pasta, most fruits, starchy vegetables and many processed snacks -- to encourage your body to lose fat. Often, this pushes you into a state of ketosis, a process that occurs when you burn fat for fuel. Ketosis isn't inherently harmful, but in some cases can lead to a build up of the ketone bodies, causing dehydration and changes in your blood chemistry. Though a blood test is the most accurate way to determine if you're in ketosis, certain other physical changes provide clues that you're in this state. Your body usually uses glucose, derived from carbohydrates, for energy -- particularly to fuel the brain. Ketones are produced when you're short on carbohydrates and must burn fat for fuel. When you produce ketones for energy, you are in ketosis. Phase One, or the "Induction Phase," of Atkins will likely cause you to produce ketones. During these first two weeks, you consume no more than 20 grams of carbohydrates per day. This represents a significant restriction in carbohydrates -- the Institute of Medicine recommends you eat 45 to 65 percent of your daily calories from carbs, or 225 to 325 grams daily on a standard 2,000-calorie diet. 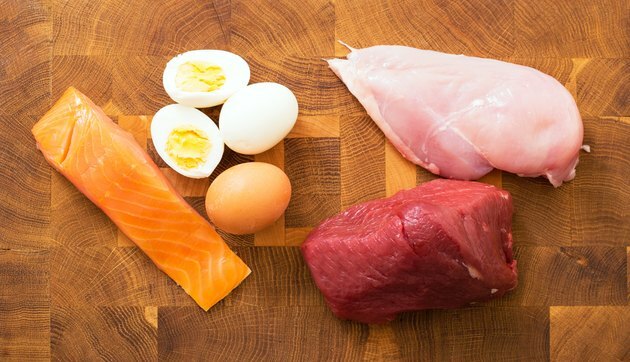 To meet your low-carb limit, the Atkins diet has you subsist primarily on meats, fish, poultry, eggs, oils, some cheese and watery, fibrous vegetables with few carbohydrates, such as lettuce and cucumbers. Ketones are burned for energy, but also breathed out through the lungs and excreted in the urine. As a result, your breath takes on a fruity odor when you're in ketosis. Your urine may also smell fruity, or slightly like nail polish remover or ammonia. You will also be able to detect ketone bodies in your urine using ketone strips. If ketones are present, then the strip will change color after having been dipped into a urine sample. You can purchase these ketone strips at most major drug stores. Ketosis causes you to urinate more frequently as your kidneys rid themselves of excess fluid. You aren't only losing water, but electrolytes -- such as sodium, magnesium and potassium. This can make you feel fatigued and foggy headed. Having too little sodium can also cause headaches. The general malaise that accompanies the first few days of ketosis is known as the "keto flu." Drink water to quench your thirst, which may be heightened during ketosis, and consider consuming extra electrolytes as well. Many people report decreased hunger when they shift into ketosis. After about 48 hours to one week, you'll feel satisfied with meals and experience fewer nagging cravings. A small study, published in a 2008 issue of the American Journal of Clinical Nutrition, showed that people on a ketogenic, low-carbohydrate diet ate less, lost more weight and reported reduced hunger compared to participants who followed a moderately reduced carbohydrate diet and weren't in ketosis. Ketones decreased the participants' appetite, so they actually chose to eat less. That might be because the brain adapts to getting its energy from ketones rather than glucose. Because the brain plays a large role in your appetite -- when it's satisfied, it doesn't send out signals to eat more. This same phenomenon can happen when you fast, or go without food for several days. However, during ketosis, your body uses fat and ketones for fuel -- not protein and lean muscle. After the first phase of the Atkins Diet, you'll likely shift out of a state of ketosis as you gradually increase your carbohydrate intake to find your personal Atkins Carbohydrate Equilibrium, the number of carbohydrates you can eat daily without gaining or losing weight. In high levels, though, ketones can become toxic and cause you to suffer from ketoacidosis.This condition occurs most often in type 1 diabetics whose insulin and blood sugar levels aren't controlled. It isn't likely when you're undertaking a controlled, low-carb diet such as the Atkins plan. If you do experience symptoms such as a rapid breath rate, decreased alertness, headache, muscle stiffness, vomiting, stomach pain and dry skin and mouth, consult a medical provider immediately to ensure your body is OK under ketosis.